Today, we woke up at 5:00am, ate breakfast, prepared our packs, and departed at 6:00am for Camp II. The day was quite cold and windy, so we didn’t stop much along the way. Lina and I arrived to Camp II (6200m) at around 10:30am and quickly dug out a tent platform in the frozen scree and set up the tent. Lina deposited her equipment in the tent and quickly began descending as it was extremely cold and she couldn’t feel her hands or feet. 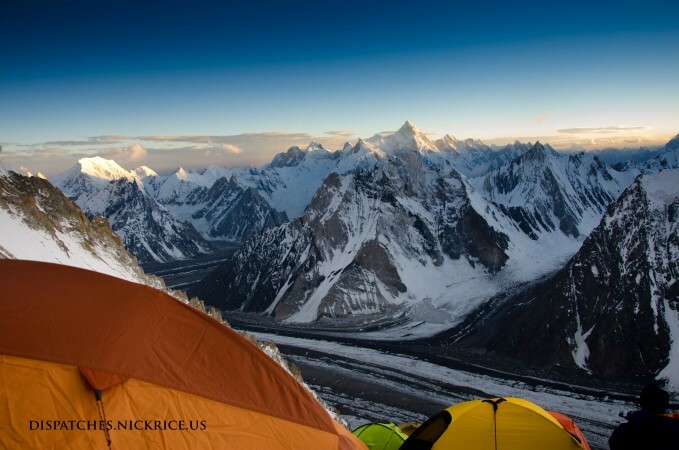 Pilar arrived shortly afterwards and also made a deposit in the tent and descended to Camp I. I continued working on the tent platform and enjoyed the view from Camp II of K2, Marble Peak, Chogolisa, Mitre Peak, and Mashabrum once the clouds had dissipated. In the evening, Badia and Mauricio (Mexico) arrived from Camp III where they had established a camp and descended due to the bitter cold. We had a tea together and discussed route conditions above Camp II, then they descended the rest of the way to their tent in Camp II. Since I don’t have a headache here in Camp II, I plan on ascending a few hundred meters toward Camp III (7040m) in the morning, then descending directly to Base Camp to rest for a few days. Unfortunately when swapping out the food I had stored in the deposit, I didn’t realize that the bag I grabbed only had one dinner in it, so I had a protein bar and a tea and went to sleep hungry. The night was bitterly cold and my sleeping bag was no match (I’m sure it doesn’t help that I am not properly acclimated to this altitude) so I spent a very cold and uncomfortable night in Camp II.